This is an amazing story. 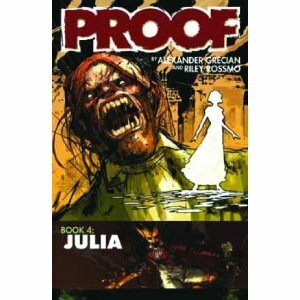 Not just for the Proof continuity but in terms of storytelling in general. It has a villain who is monstrous but not cartoonish, and non-humans who are paragons of humanity. There is a love story in several different guises and you know things will never be the same once you reach the end. Whilst not quite the hallowed Origin Story we do spend most of our time in Gulliver’s past and learn a lot about him. If you are smart enough you will also spot a glimpse of his future too. It is neatly bookended in the present day and follows seamlessly from the threads started in the last book. The art is wonderfully impressionistic eschewing realism and convention. Out of place patterns and colours forewarn you of dangers to come and things hidden below the surface. After three books of avoiding the colour red it is now everywhere complimenting the story’s murderous themes. The art doesn’t show you what you see but what you feel using bold visual techniques. This won’t be to everyone’s taste, and it certainly is different, but if you get it you will love it. This is the most human book as it deals with themes we can all experience and understand, even if those feeling them aren’t like it. Its monster-of-the-week is the attitude of the period. It has a lot to say on this matter and it speaks most eloquently. A sincere Double Thumbs Up! This entry was posted in Graphic Novel and tagged Alexander Grecian, DOUBLE Thumbs Up!! by 365gn. Bookmark the permalink.